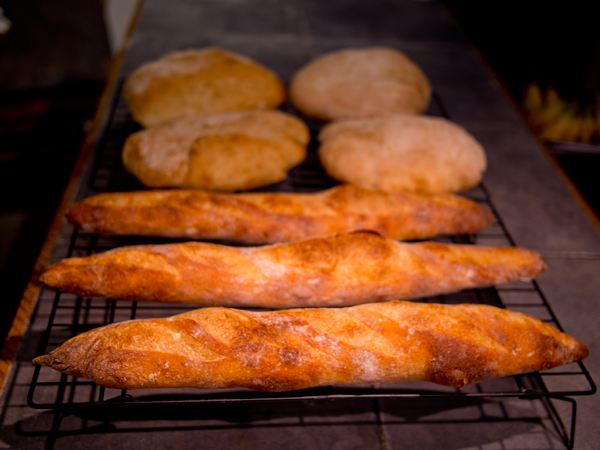 TXfarmer's 36+ hour baguettes. WOW! Submitted by greenbriel on February 14, 2015 – 9:32am. I was very skeptical when I took the dough out of the fridge after 24 hours, as it didn’t seem like it had risen at all. I felt like the youthfulness of my starter had failed me, but what the hell, give it some warmth and see what happens. After maybe 5 hours on the counter we were in business! Nice bubbling and doubled in volume! I couldn’t believe it. Preshaped, shaped, proofed on a couche and then into the oven with steam. Shaping and scoring probably not as good as the last batch, and no ears, but the crust and crumb were good, and the TASTE! So delicious! I gave one to a friend who went to meet friends for a drink and they ate it at the bar within minutes! And of course a huge shoutout to txfarmer for the encouragement and AMAZING recipe. You are a wizard [tips hat]. This site has improved my baking enormously in just a couple of weeks! Thanks Floyd!